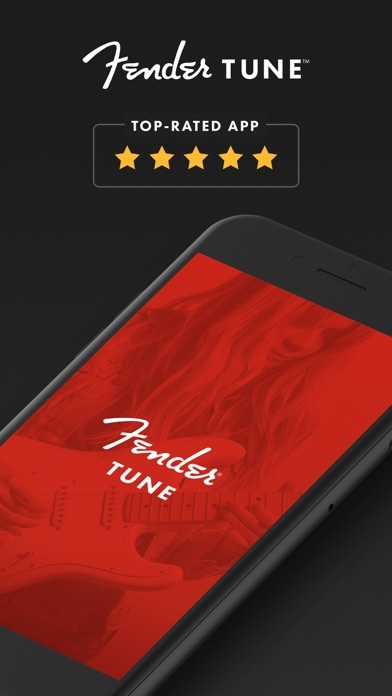 Fender Tune is the 5-star rated, easy-to-use, super-accurate tuner app for guitar, bass & ukulele from Fender®. 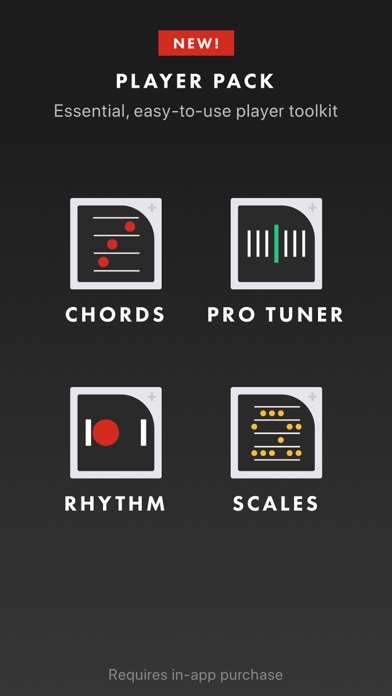 The updated Tune app comes with an all-in-one Player Pack practice kit, featuring chords, scales, built-in beats, advanced tuning capabilities and a metronome, all available for in-app purchase! 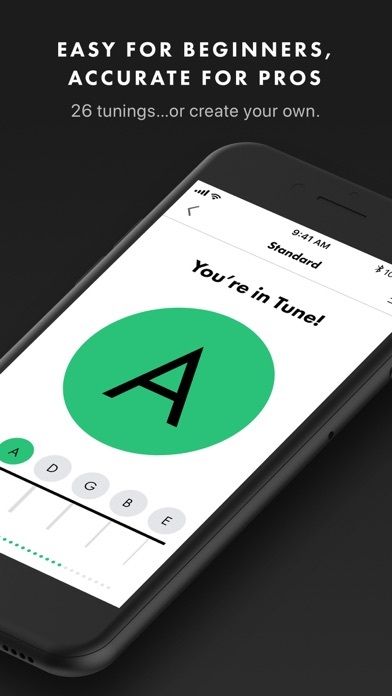 PERFECT FOR ALL MUSICIANS, FROM BEGINNERS TO PROS The all-new version of Fender Tune features the same free, easy and accurate tuning for guitar, bass and ukulele, along with 26 alternate tunings. The Pro Tuner option adds greater precision and flexibility with adjustable A=440 Hz reference. FREE Fender Tune App Features: • Easy-to-use, ad-free interface • Auto-tune, manual, chromatic and custom tuning modes • Instrument specific tunings for electric, acoustic, bass and ukulele Auto-Tune Mode • The app hears the note and guides you to a perfect pitch • A string-by-string diagram guides the selected tuning Manual Tune Mode • Select acoustic, bass and electric guitar • Tap a string on the interactive Fender headstock and tune your guitar Chromatic Mode • Tune to any note on the scale • Chromatic Mode recognizes each of the 12 chromatic (semitone) steps of the equal-tempered scale Pre-Set Tunings 26 tunings available, including: • Standard (EADGBE) • DADGAD • Open G • Drop C • Full-step • Half-step • and 20 more Custom Tunings • Create your own custom tunings and save to your Fender Connect personal profile for easy access PRO-Tuner Available with In-App Purchase • Real-time visual feedback • Additional tuning styles featuring exact cents and hertz reference • 40 different non-standard tuning references (A=420Hz to A=460Hz) PLAYER PACK ALL-IN-ONE PRACTICE TOOLKIT WITH IN-APP PURCHASE Get more out of your practice with the Player Pack all-in-one toolkit, which includes chords, scales, built-in beats, advanced tuning capabilities and a metronome, or purchase each tool separately. 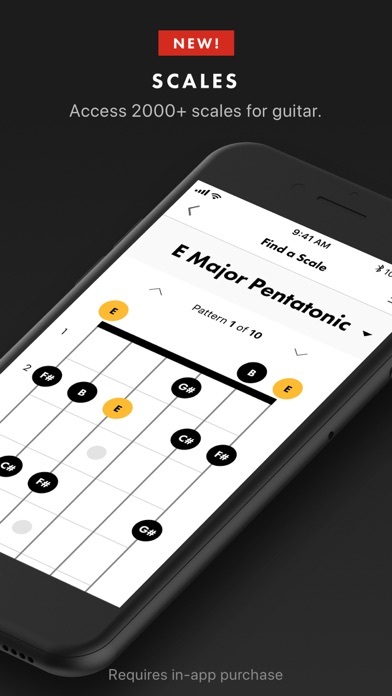 CHORDS Discover new harmonic horizons with more than 5000 shapes in Fender's new dynamic chord library. • New proprietary technology dynamically creates any chord pattern, with multiple shape variations, anywhere on the neck • Get chord diagrams and finger placement for any chord • Look up every chord variation in any position • Find a chord by note • Browse through curated chord collections • Includes chords for six-string guitar only SCALES Explore new melodies and improve your lead playing with a new dynamic scale library based on the same proprietary technology as Fender's new chord library. • Find scale diagrams and patterns for any variation, flavor and key • Find patterns in any key anywhere on the fretboard • Quickly learn complex scales with easy-to-understand visuals • Includes scales for six-string guitar only RHYTHM Improve your playing and have more fun practicing with a simple but flexible drum kit. • Choose from 65 different drum rhythms across 6 different genres (Rock, Blues, Jazz, Metal, Funk/R&B and World) • Features 65 one-touch, pre-programmed beats: West Coast Blues, Kingston Groove and many more • All drum sounds are based on an authentic acoustic drum kit, specially created just for Fender • Select your tempo and customize your time signature to practice with any rhythm • Also features standard metronome mode PRO TUNER Tune your guitar, bass or ukulele with greater visual precision and even more flexibility • Get real-time visual feedback to find the exact tuning you're looking for • Explore more tuning styles with exact cents and hertz reference • Choose from 40 different non-standard tuning references, from A=420Hz to A=460Hz -- Since 1946, Fender® has set the standard for expertly crafted, high-performance instruments and audio equipment. 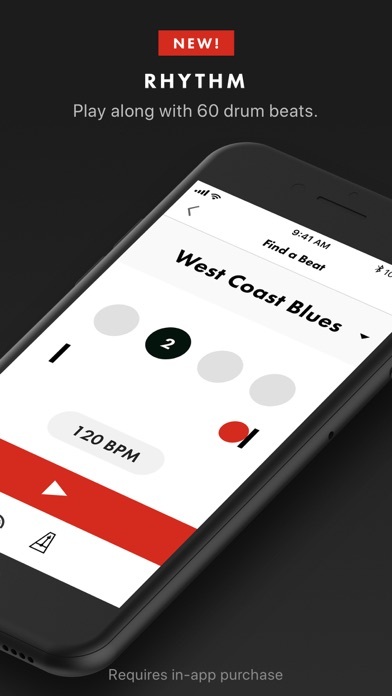 Fender Digital, a new digital products division, is extending the vision with a precise and easy-to-use guitar, bass and ukulele tuner iPhone app. Made me break my e string. 👎🏼👎🏼👎🏼👎🏼 I don’t have any money to replace the whole set of strings too. Thanks a lot! My headstock tuner needs batteries and this app fills the gap for me just fine. Accurate and fast on my iPhone SE. Thanks Fender! Great app but when used on iPad, on which lessons play nicely in landscape, stays sideways (and uses bad-for-iPad iPhone keyboard). Definitely accurate on tuning. I suggest you get this if you do not know how to tune by ear. Many other features as well!!! 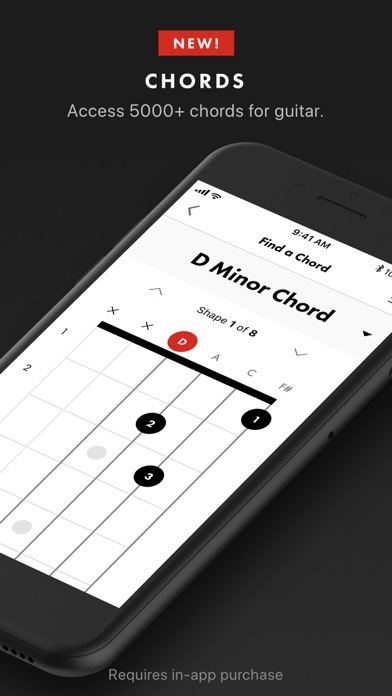 This is a great app that works great for my guitar! This is awesome that a free app can be this good at tuning. 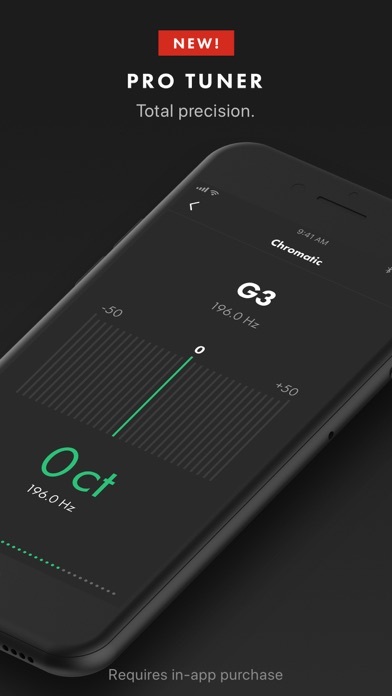 I’ve never seen a better tuning app.